Has yoga improved your health and expanded your awareness--but emotional and relationship issues continue to challenge you? Or have you found psychotherapy helpful . . . yet you yearn for further spiritual discovery? 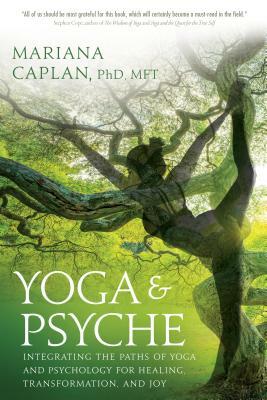 With Yoga & Psyche, Mariana Caplan invites you to explore these two profound domains of transformation and learn how they so effectively complement each other. In this compelling guide--rich with original research, clinical findings, Dr. Caplan's own personal experiences, and many direct, hands-on practices--she takes you on an in-depth exploration of this emerging terrain. Along the way, you are invited to become a participant in the evolution of this emergent field. - Discover how to use psychological inquiry to amplify yoga--turning it into a powerfully effective "free therapy on the mat"
Yoga & Psyche is emerging as a go-to reference guide to the joining of these two fields, now being adopted in yoga and somatic teacher training programs and university psychology classes nationwide. If you're seeking healing, transformation, and greater moments of daily joy and fulfillment--or want to help others do so--this comprehensive guide provides the compassionate, practical, and groundbreaking guidance you need. Mariana CaplanMariana Caplan Mariana Caplan, PhD, MFT, E-RTY 500, is a psychotherapist, yoga teacher, and author of eight books in the fields of psychology, spirituality, and yoga. She has been teaching workshops and trainings online, in yoga studios and universities, and at major retreat centers throughout the world since 1997. She is the founder of Yoga & Psyche International, an organization created to integrate the fields of yoga and psychology globally, and lives in Fairfax, California. Learn more at realspirituality.com and yogaandpsyche.com.